Having a habit for accomplishing things late, I began on my Valentine’s day gift for Tania the day before Valentine’s day. The reason was because I thought we were exchanging gifts the following weekend. Little did I know we somehow mutually agreed to exchange gifts the weekend before. I stole the idea from Reddit. 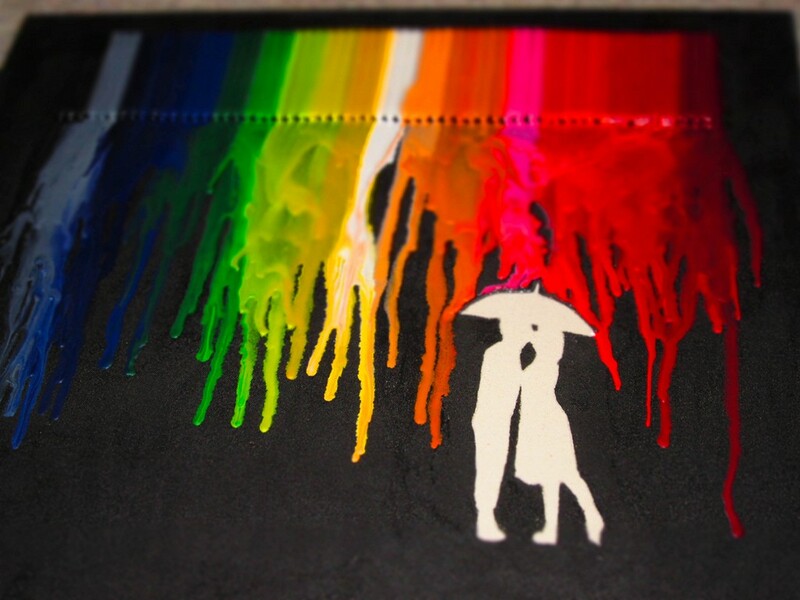 It is a canvas with crayons melting onto a couple under an umbrella. Took much longer than the estimated 1.5 hours to complete. I worked on it a little each day. 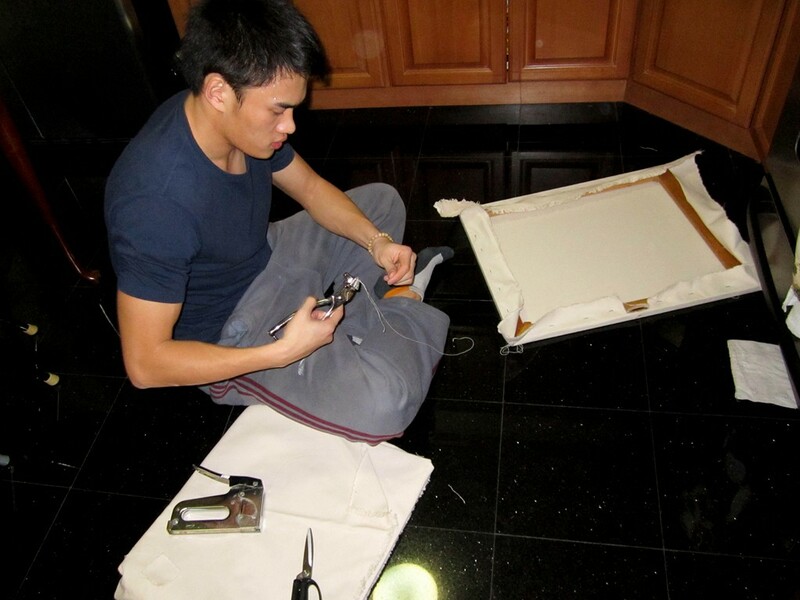 All the thanks goes to Ming Huang for helping me put the canvas together on day 1 (Monday). That was the day I bought 3 boxes of crayons (72 pieces) and a hot glue gun. 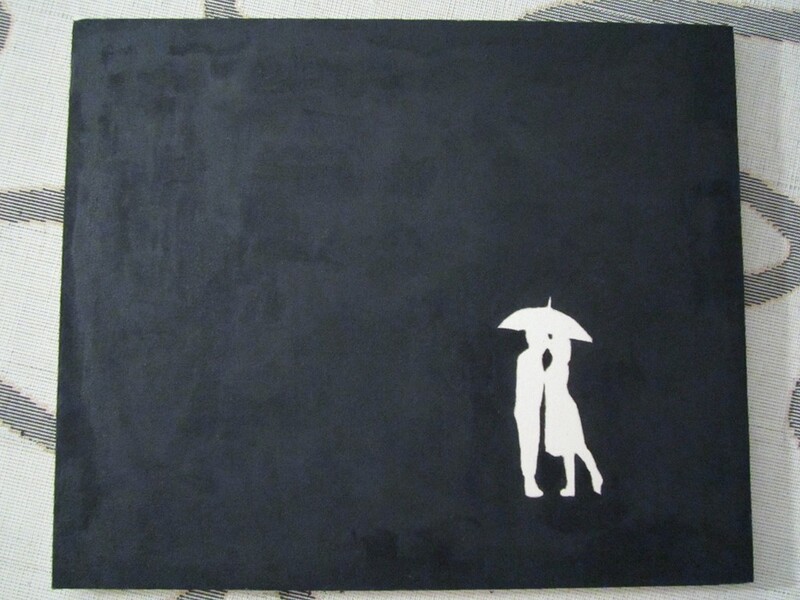 I brought it all home and sketched the couple onto the canvas. 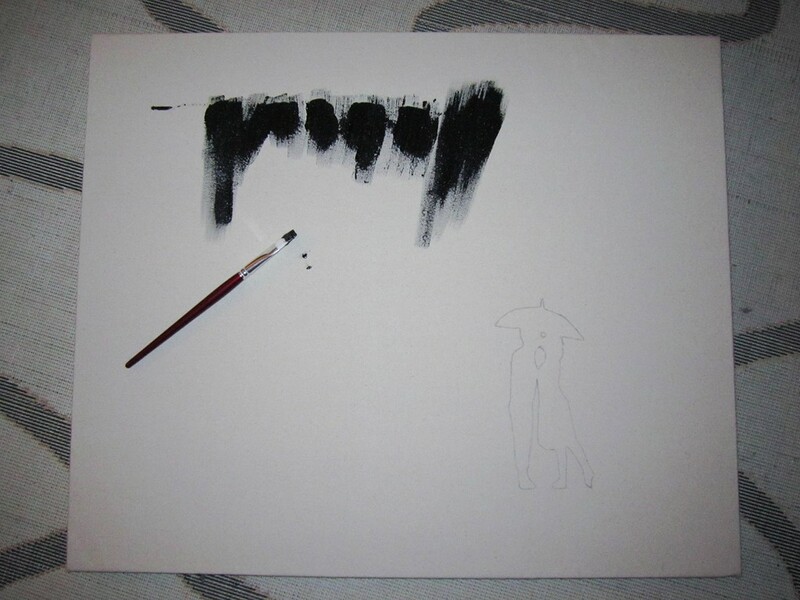 On day 2 I painted the canvas with black paint. 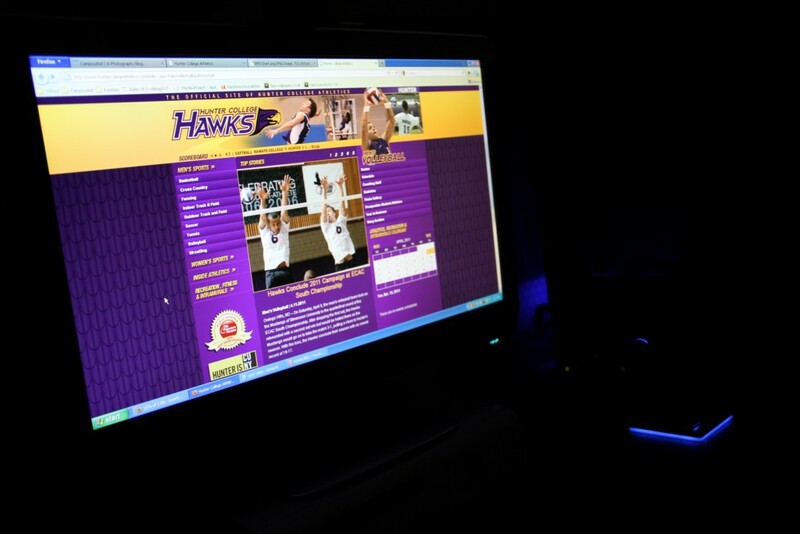 It was a lengthy process, but very relaxing. After the paint dried I noticed some unevenly painted surfaces, but I couldn’t repaint it due to lack of paint. 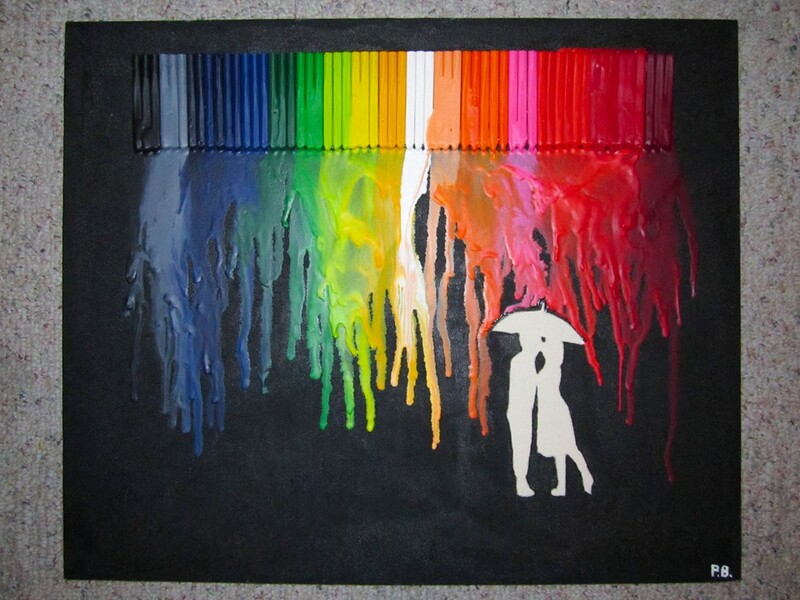 I also figured that once the crayons melt onto the canvas it will be hardly noticeable. I let let the canvas dry and arranged the crayons in the order I planned to stick them to the canvas. I then spent some time peeling the paper from the crayons. 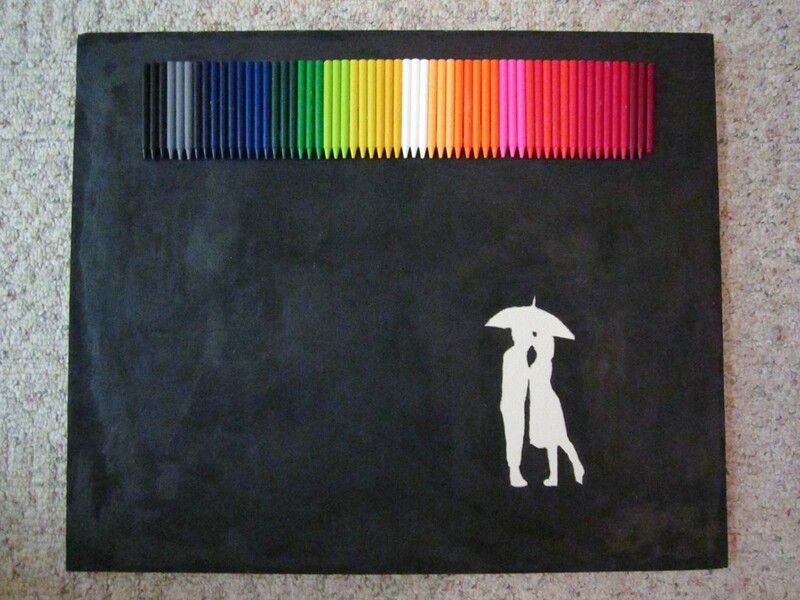 My mom had suggested that the lighter crayons be placed above the couple as a symbol of youth, and happiness. I’m glad I ended up agreeing with her. 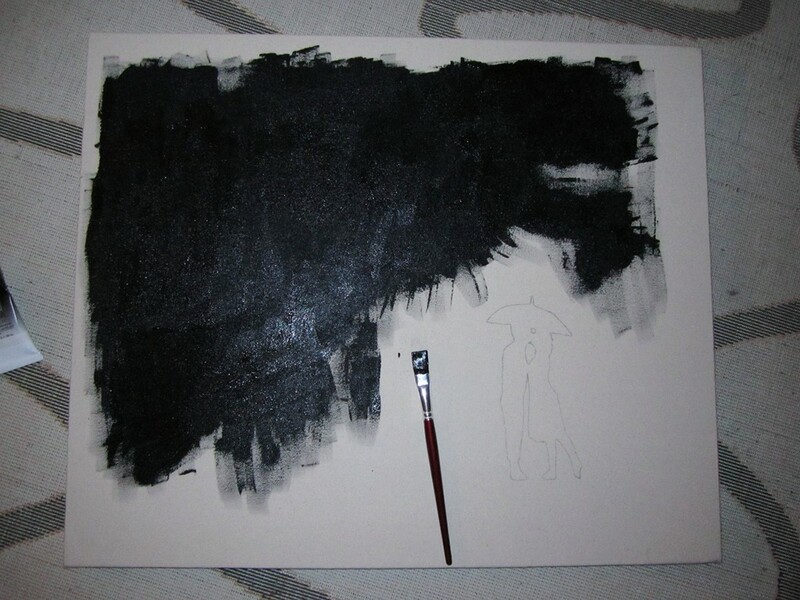 As you can see the left side of the canvas looks a bit dull with the darker colors of the spectrum. 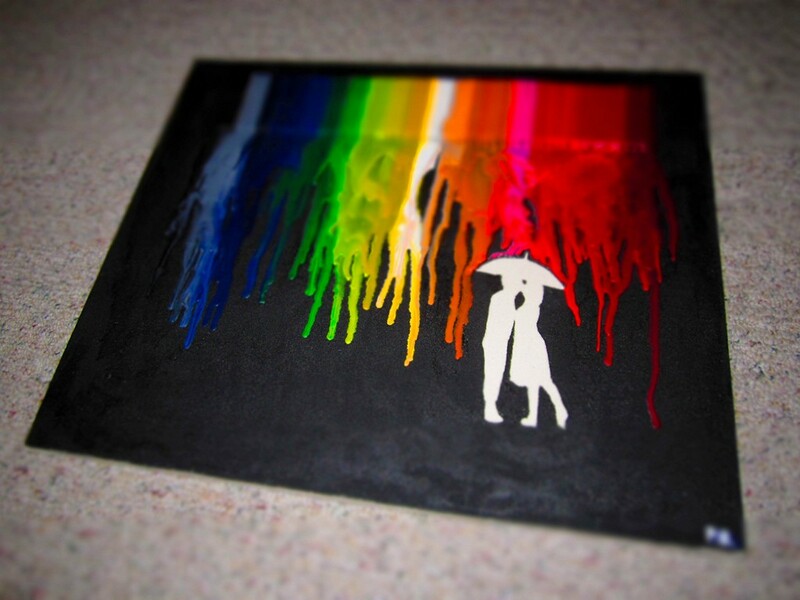 I spent the rest of the time trying to figure out how to stick the crayons onto the canvas. I originally tried using the hot-glue gun, but I found that the crayons did not stick well. I then thought I would buy some Krazy Glue and therefore waited till the next day to paste the crayons. I decided to practice melting some leftover crayons onto a cardboard calendar for practice. The Krazy glue didn’t work as planned and I had to think fast since my days were running short. I decided to use Elmer’s Glue which worked perfectly. 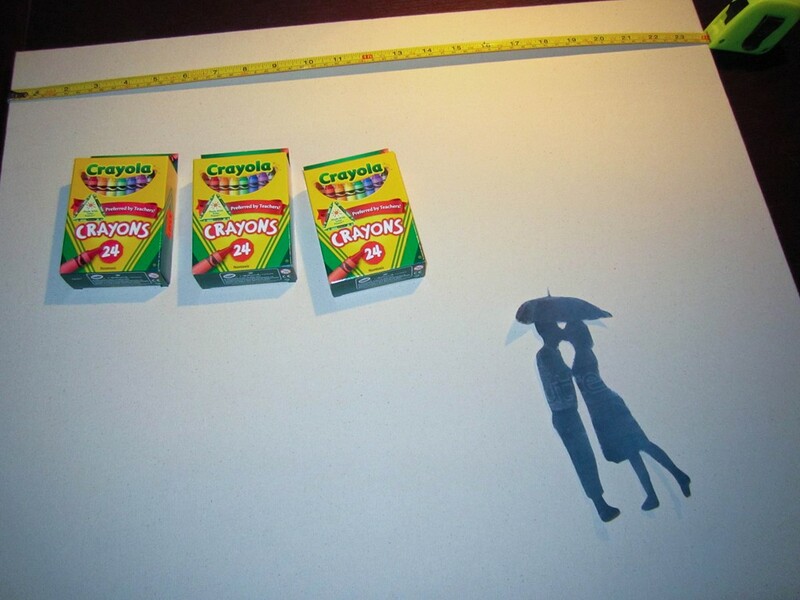 After sticking the crayons onto the surface I waited for them to dry to test how firm the bond was. Surprisingly it worked. I was a bit nervous that it will not bond since the crayons are nonporous. Day 3 was concluded and now it was on to the melting. I came back home on Thursday after the the Brooklyn College game and began melting the crayons. 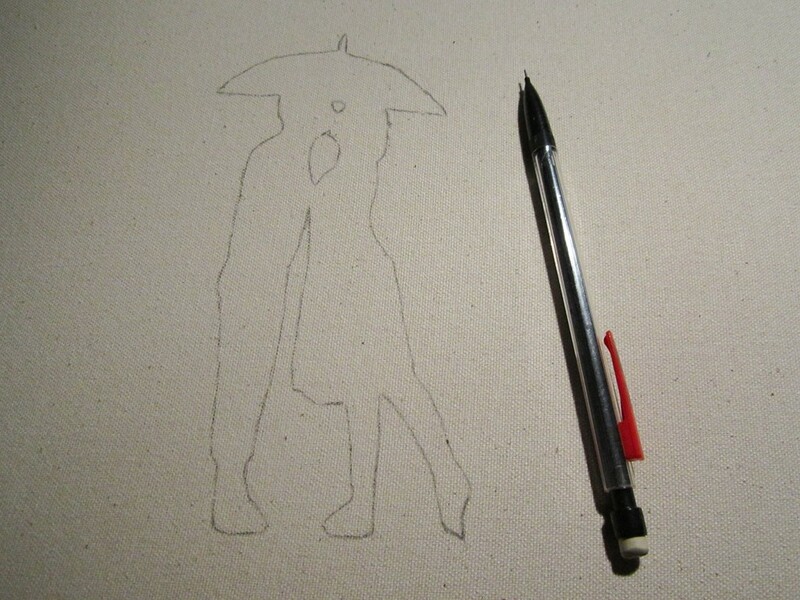 I started from the left side of the canvas and moved my way to the right. After reading some suggestions online I managed to melt the crayons into layers. 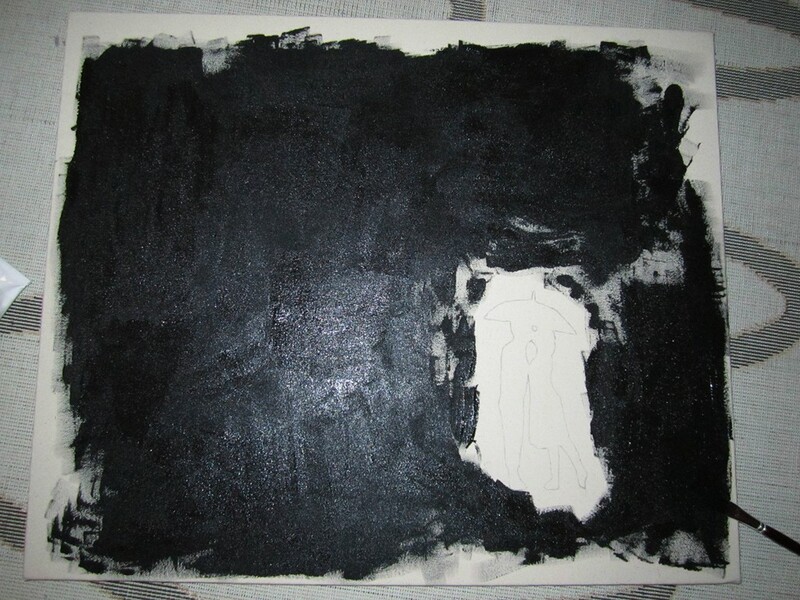 I figured that I would use the hot-glue to create a barrier between the black canvas and the couple (in order for the crayons not to melt onto the couple). I applied the glue and then moved my way into the brighter colors of the spectrum. Melting took about an hour. I moved the canvas into my room and glanced at it every so often before my dreams overtook me. It is now Friday, and I am anxiously waiting to see her reaction as I present the gift. I hope she likes it as much as I like the one she gave to me. All the pictures in this ‘project’ were taken with the camera she gave me. I will sign the canvas with my initials and present it to her later in the day. I’m pleased to say she was very thrilled to receive the piece. Not sure if that was because she wasn’t expecting it or whether she loved it so much. Either way I feel that my effort was well rewarded. this is sooooooo pretty. you are soooooo sweet. this is seriously very creative and a really personal sweet present for my sister. Just keep trying. I am not sure how well this works on wood. 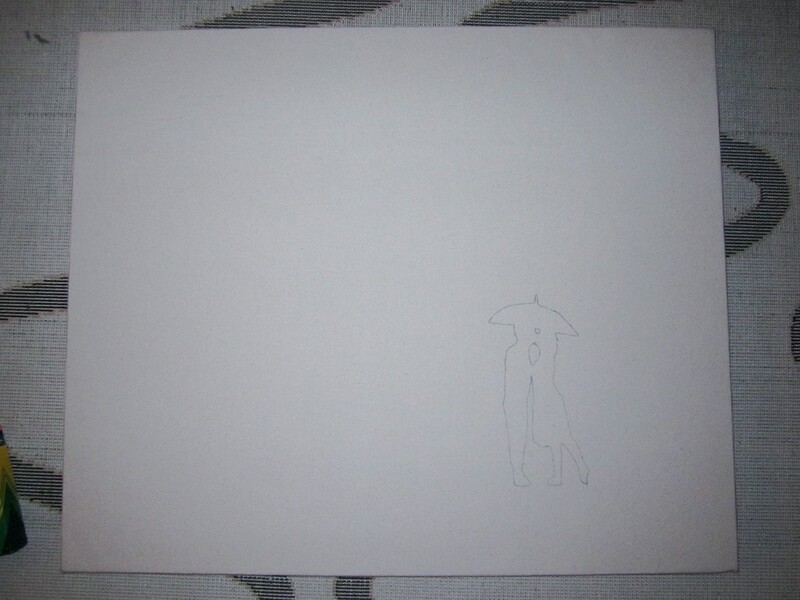 But I used a canvas and it worked fine. Hope that helps.